Seven years and $760 million dollars later, Vale has opened the doors to a new mine in Ontario's Sudbury Basin for the first time in more than four decades. The Totten Mine – which Vale calls 'Canada's mine of the future' – officially opened on Friday in the presence of Ontario Premier Kathleen Wynne, Minister of Northern Development & Mines Michael Gravelle, members of the Sagamok Anishnawbek First Nation and other community leaders. "The opening of Totten Mine reinforces the strong confidence we have in our world-class base metals assets to deliver sizeable value through all commodity cycles," the company wrote in a news release. "Vale is committed to its future in Canada and across base metals and we are pleased to be able to celebrate this historic milestone for our company and the Greater Sudbury community." The project provided work for 500 people during construction and will employ 200 during the production phase. 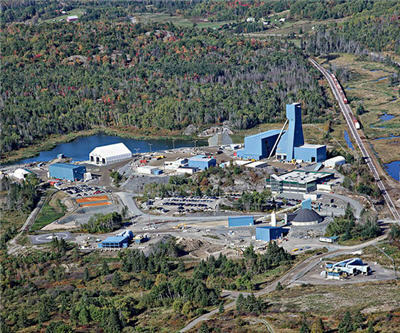 "Totten Mine is so important to the prosperity of Northern Ontario," Wynne said. "It will create good jobs and help foster economic growth in the region and beyond. Full production is expected in 2016 at which point the mine should put out 2,200 tonnes per day of of copper, nickel and precious metals for 20 years. Totten's opening comes at a difficult time for Canadian mining. Just last week Labrador Iron warned that it might have to shut operations due to low grades and an unstable iron ore market. One week earlier Cliffs Natural Resources said it would slash 500 jobs in Newfoundland and Labrador. The Ontario government is fighting hard to boost its mining sector. The province recently announced that it had hired consulting firm Deloitte to help move forward the development of the mineral-rich Ring of Fire region. But Cliffs Natural Resources, a company with claims in the area, suspended its plans late last year.